I've been writing books, articles, and blog posts about PowerPoint since 1995. In 2010, Microsoft gave me the PowerPoint MVP award and I'm one of only 14 in the United States. But I wrote this e-book because I saw that many of my clients used PowerPoint inefficiently. They didn’t know any shortcuts or techniques for getting the job done easily, so they struggled needlessly. The reality is that most PowerPoint users spend WAY more time creating slides than they need to, just because they never systematically learned PowerPoint. They're missing simple tips that every PowerPoint user should know. Not only do they waste time, but they get frustrated trying to complete simple tasks in PowerPoint. Or they don't even know they can accomplish them at all! 101 Tips Every PowerPoint User Should Know solves this problem and helps PowerPoint users like you get more done more easily. This e-book covers PowerPoint 2007, 2010, 2013, and 2016 (including the Office 365 version) for the PC. It gives you easy-to-follow step-by-step instructions with full-color illustrations. When you purchase, you immediately get a download link. 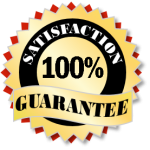 You can have this e-book in a few minutes and start using it right away. You won't find anything like it in bookstores—in ease of understanding, information focused on what you need, or price. I guarantee that you'll learn tips in this e-book that will teach you something new, save you time, or make your work go more easily when you create slides in PowerPoint. If not, tell me so within 30 days of your purchase and I'll refund your money. When you purchase 101 Tips Every PowerPoint User Should Know, you'll also get a video lesson on using the Rule of Thirds when designing slides, including the PowerPoint file. The Rule of Thirds principle is a well-known 2D design principle that will help you create great-looking slides, even if you are not a designer. "I teach an MBA course Business Presentations. I also develop and conduct business skills seminars. I learned how to use PowerPoint the hard way; self taught. 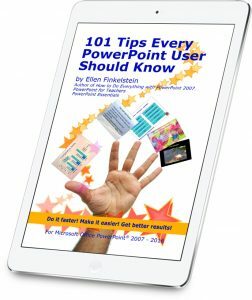 Your book, 101 Tips Every PowerPoint User Should Know, taught me many "little" things I did not know. I keep it close by as a handy reference." “I've used PowerPoint 15 years, yet even this old dog can learn new tricks. Well organized & clear!" 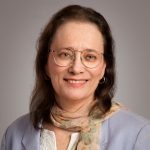 - Rebecca Renner, Creative Minds, Inc.
A slide list is very useful for navigating when you deliver your presentation, especially if you may be jumping around. In PowerPoint 2007 and 2010, click the Outline tab of the left-hand pane. In PowerPoint 2013 and later, choose View> Outline View. Right-click in the Outline pane, and choose Collapse> Collapse All. Choose File/Office button> Print. In PowerPoint 2007, from the Print What drop-down list, choose Outline View. 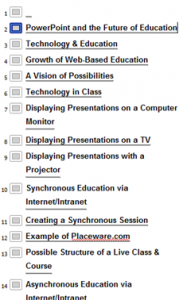 In 2010 and later, go to the second drop-down button (it usually reads “Full Page Slides”) and choose Outline. Click Print. This 4th edition of 101 Tips Every PowerPoint User Should Know contains new tips on animation and covers some of the features of Office 365 that are not available in any other version of PowerPoint. P.S. There's really no reason to continue to waste time and struggle when your work could go much more easily!